Da Bruno is probably one of the most famous chains of quality restaurants in Marbella. If you haven’t been to any Da Bruno restaurant yet, you haven’t really been to Marbella. Da Bruno has a total of seven restaurants in and around Marbella, which are the following: Pasta Da Bruno (Marbella, Avenida Ricardo Soriano), Da Bruno a Casa (Marbella Mar, Golden Mile), Da Bruno a Cabopino (Cabopino), Da Bruno Sul Mare (Marbella, Paseo Marítimo), Da Bruno a San Pedro (San Pedro del Mar), Da Bruno Cabopino Take Away and Delicatessen (Cabopino) and recently Da Bruno Mijas Costa (Mijas Costa). The biggest Da Bruno restaurant is Da Bruno Sul Mare. It is situated at the Paseo Marítimo in Marbella in the Edificio Skol. This is close to where the horse carriages are next to the Parque de la Constitución. 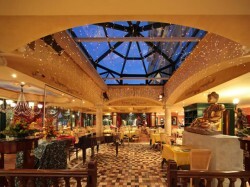 The restaurant has a capacity of 400 guests, which is huge. The restaurant is separated into three areas. The main area is the inside area, which has the nicest fittings and looks like a Florentine palace with a glass dome. The second area I would call a closed terrace. It has a lot of light but is closed. The third area is the terrace itself which is actually on the promenade, the Paseo Marítimo. From here you have fantastic views to the Mediterranean and one can observe people passing by. In summer this is definitely the place to be. The restaurant is perfect to host banquets, celebrations and corporate events. The service is impeccable and you always have the supervision of Bruno and Giuseppina Filippone themselves. The owners of the Da Bruno restaurant chain are always present at the Da Bruno Sul Mare restaurant and kindly help and greet every visitor. I had a chance to have a nice chat with them and take a picture. I was quite impressed that both speak a very good german, as they lived in Germany for many years. Probably the best in this restaurant is the live music they have every night. There is a big stage in the middle of the restaurant with a piano. Every night there is somebody playing the piano and somebody else singing. The last time I have been there was just before christmas. An english singer sang some italian opera, which was surprisingly amazing. At a later time that night guests even started dancing between the tables. Apart from an exquisite service and a friendly atmosphere, the culinary offerings are difficult to surpass. Da Bruno offers quality Italian cuisine. They masterfully combine traditional recipes from the mamma like carpaccio or fresh mozzarella ‘alla Caprese’ as well as trendy culinary know-how like a linguine with lobster. If you just want good pasta, Da Bruno is definitely the place to go to.